Our selections by artists working in the 19th century includes the ever-popular Anonymous, hard at work in a number of different genres and with results varying from work to work. Some are no more than a travel record, others quick sketches from life, others still, ways of thinking about possible ways to lay out a composition, yet still others finished works of art serving not only as a model for another work but as independent, polished pieces capable of standing on their own (see particularly the portrait of a young woman on the "Portraits" page (and below). Some of these artists are anonymous because they never had any desire to be thought of as artists; others because they feared that the little they knew about how to draw could serve to help them remember something they wanted to remember but feared that publicly releasing them might bring them unflattering public attention. Others are by professional artists, sometimes continuing a long-time family trade, sometimes immensely successful, sometimes barely known, whose drawings were meant to serve as a resource to them and to their assistants. In some cases. the works are signedpossibly for presentation; in other cases the style presents a signature almost as reliable as the thing itself. We have identified works by Hans (Johann) Beckmann, Theophile Chauvel, Heloise Suzanne Colin, Felix O. C. Darley, the Count D'Orsay, E. F. Gehme, Otto Greiner, Emil Kinkelin, Johann Mader, Mauer, Lothar Meggendorfer, Samuel Prout, Adrian Ludwig Richter, Marianne von Rohden, and Adalbert Wolfe. Marianne von Rohden (German, 1785-1866), View from a grotto. Brush, brown ink, and wash. The artist was a painter. She married the painter Ludwig Hummel, Their daughter, Suzette Hauptman, was also an artist and she too married an artist. Her brother, Johann Marten Rohden was also a painter. This family netweik suggests the kinds of tightly-knit communities that seem to support the artist. Image size: 191x2476mm. Price: $1275. Mauer (German or Austrian, 19th century), Road through the woods. 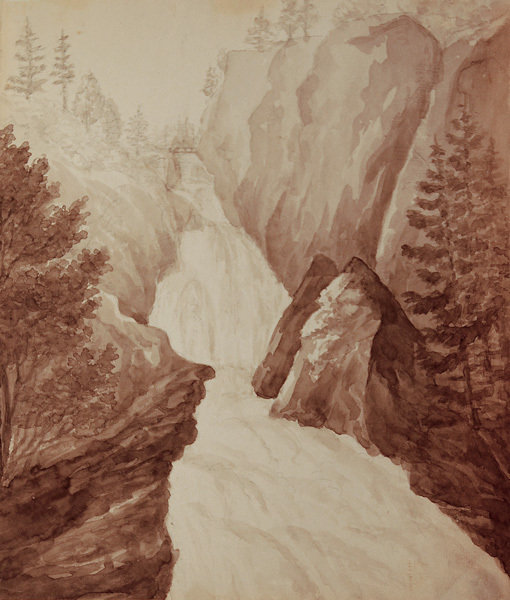 Original ink and wash, c. 1840. Signed and titled in ink lower right. Image size: 318x260mm. A beauiful exploration of the romantic sublime. Price: $1275. E. F. Gehme (Austrian, 19th century), Landscape with Mountain Stream. 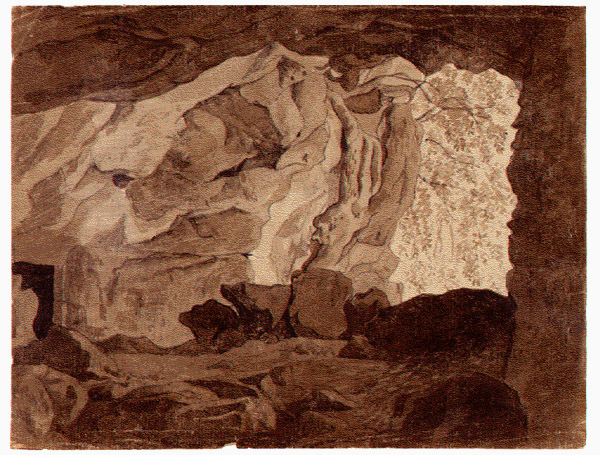 Ink and wash on wove paper, c. 1830. Signed in pencil on the reverse. A very Romantic landscape appealing to the same taste that enoys the desciptions of the sublime intensity of the mountains in Marry Shelley's romance, Frankenstein, written slightly before this piece. Image size: 242x206mm. Price: $875. Theophile Chauvel (French, 1831-1909), Trees. 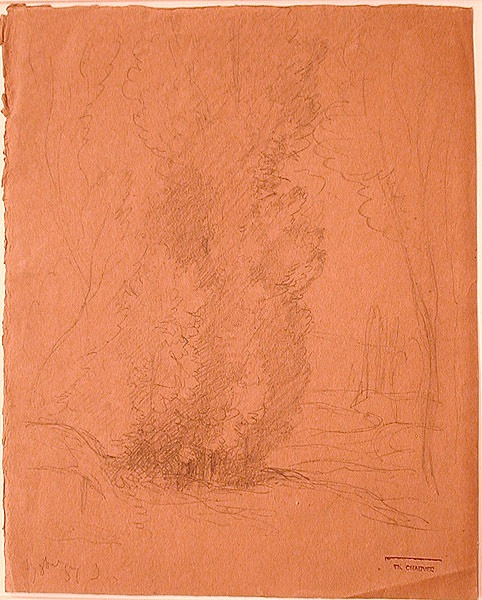 Pencil drawing on chamois paper, 1857. Chauvel was a very successful painter and etcher associated with the Barbizon School in the second half of the 19th century. The drawing has the atelier stamp in the lower right corner. Image size: 275x220mm. Price: $1750. 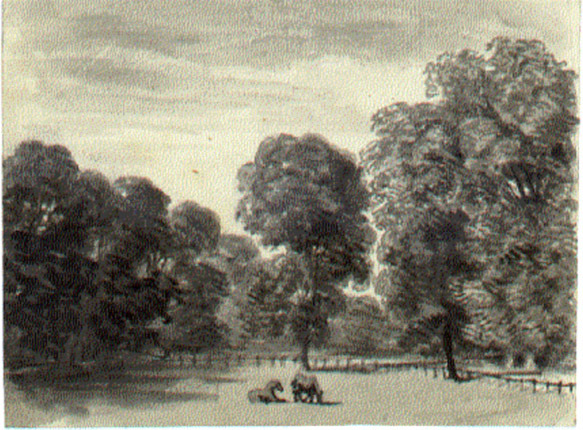 Anonymous (English School, early 19th century), Two horses grazing in a park. 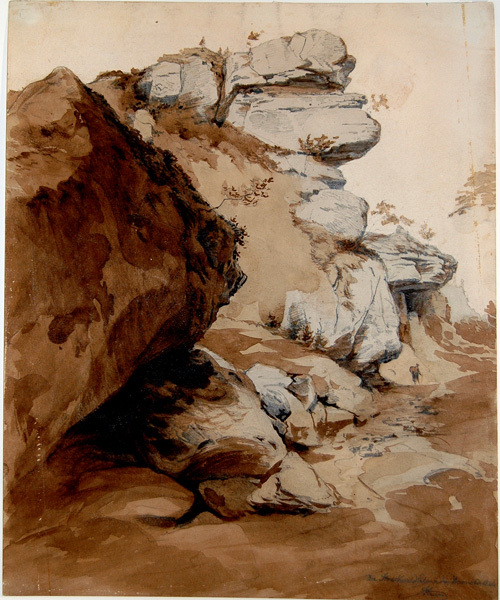 Ink and wash on paper, c. 1830. This is part of a collection of drawings put together in the 1830s by an Oxford don. Image size: 112x150mm. Price: $750. 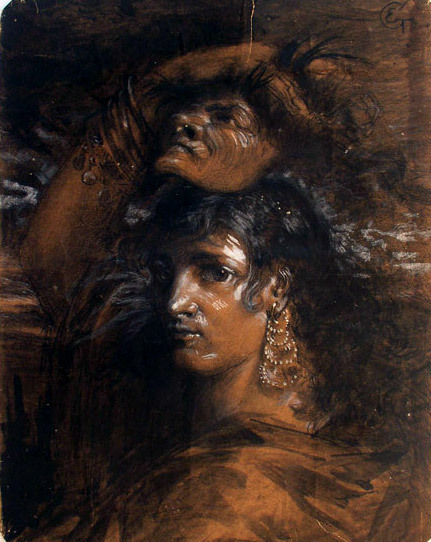 Eva Gonzalès (French, 1849-1883), An actress with a mask. Brush and black ink and wash with white gouache heightening and black chalk on tan wove paper. Initialed in pencil upper right recto with a small "E" within a large "G"; signed or inscribed "Eva Gonzales" verso in pen (this signature is very close to that illustrated in Sainsaulieu and Mons, n. 62, p. 155, c. 1873-74). The earrings that the actress is wearing are similar to the very elaborite earrings that the artist is wearing in a photograph of her in Sainsaulieu and Mons, p. 5, which depicts a long elaborite earring with three separate levels in her own ear. Vertical tear top center; diagonal tear bottom right. Paper losses at corners. Image size: 296x220mm (11-3/4x8-3/4 inches). Price: $275,000. Gonzalès was Manet's only pupil. She showed regularly until her untimely death in childbirth. A recent show of "Impressionist Women: Mary Cassatt, Eva Gonzalès, and Berthe Morisot" at the Musée Marmotan in Paris and the accompanying book suggests that she indeed belongs in the company in which the show placed her. See the page dedicated to Gonzalès on our website. Otto Greiner (German, 1869-1916), Figure studies. Watercolor and wash on wove paper, signed and dated 1896. Greiner studied in Munich, where he trained in lithography and etching. He went ot Rome, where he became interested in the work of Max Klinger, also one of Kathe Kollwitz' inspirations. Later he turned to painting on canvas and to pastels. He was awarded an "honorable mention" at Universal Exposition of 1900. 75 of his drawings have sold at auction since 1987; a sanguine self-portrait reached a high of $34,000 at Sotheby's Munich in 1996. 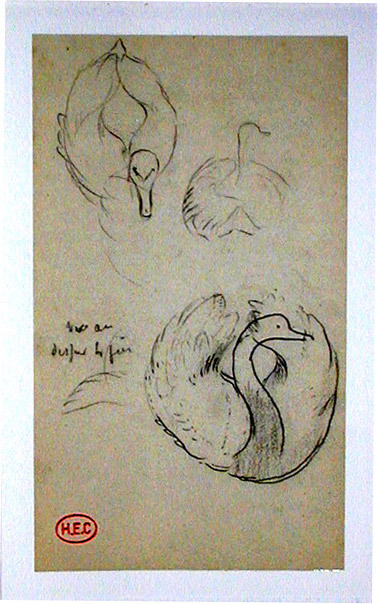 There is a study of his drawings in the Meister der Zeichnung (Masters of Drawings Series), by Hans W. Singer, Zeichnungen von Otto Greiner (Leipzig: Baumgärtner's buchhandlung, 1912). 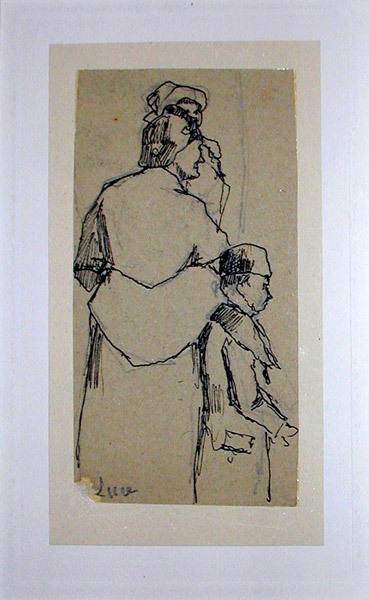 A drawing very similar to ours, signed by Greiner and also dated "Sept 1896" is in the Kupferstich Kaninet in Dresden. 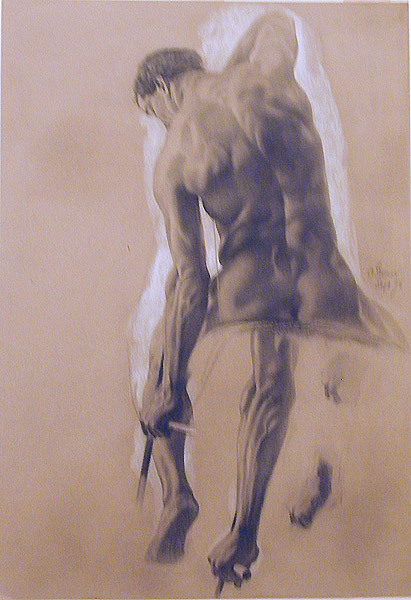 See also Julius Vogel, Otto Greiner (Leipzig: Seemann, 1903). Image size: 446x305mm. Price: SOLD. For a very powerful Crucixion featuring death and a devil waiting in the forground of the engraving, please click here. Henri-Edmond Cross (French, 1856-1910), Swans. Original ink drawing, c. 1899. Stamped with the Cross estate's studio stamp to indicate it was part of the estate at the time of the artist's death. There is also an unreadable inscription in ink left center. Image size: 170x98mm. Price: $3500. Maximilien Luce (French, 1858-1941), Mother and Child Walking. 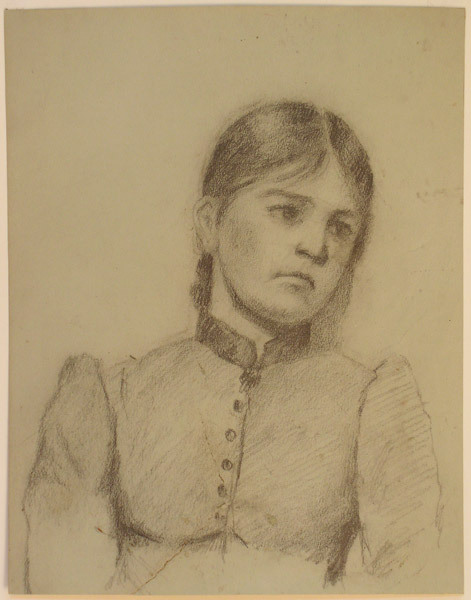 Original pencil and ink drawing, c. 1900. Signed in pencil bottom left. Small tear bottom left. Luce was a friend of Signac and a member of the Neo-Impressionist movement who helped to popularize Neo-Impressionism outside of France. there is an etched portrait of him in Dix Peintres de XXe Siecle by (1927) V. J. Roux-Champion. Image size: 127x66mm. Price: $3200.